Man, things are busy around here. Are they busy over there too? I bet they are. So we’ll keep this short and sweet today. Actually, not sweet. This one is savory. Very savory. I’m hosting a small Christmas Eve dinner at my place this year – just my immediate family and Chaser’s – so I’ll be spending the better part of today chopping, mixing, boiling, baking… and ew… cleaning. My sister will be in town from California and Chaser’s brother will be here from Florida. We don’t get to see them very often, so I’m looking forward to fattening them up with lots of rich and fancy foods. Seafood is traditional for us on Christmas Eve, and while I’m not making the full 7 fishes, there will certainly be a few in the mix. Every year I save up my lobster shells in order to create a luscious bisque which has become a Christmas staple. But that’s for another post. 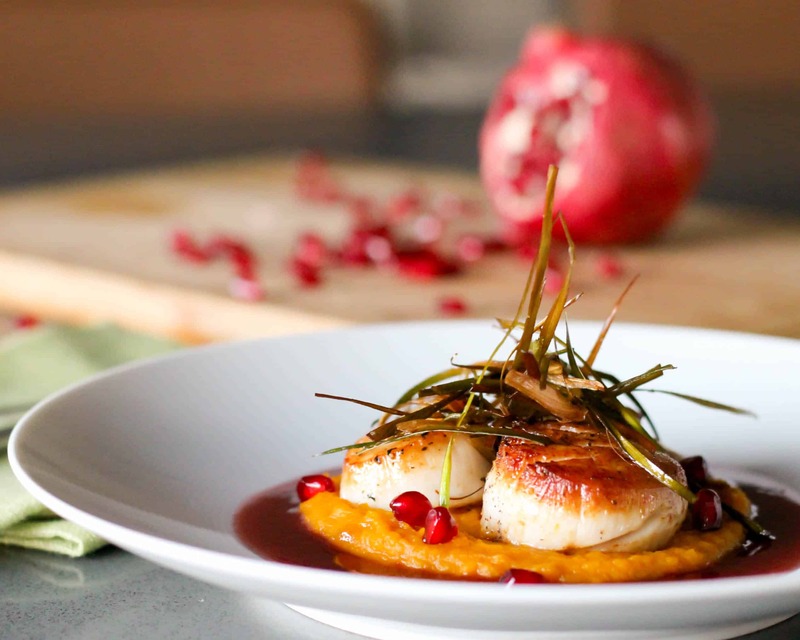 This post is all about these here scallops, and they certainly deserve their time in the spotlight. This dish is a home run for Christmas Eve. It’s colorful, festive and elegant; perfect for the holidays or anytime you want to serve something impressive. 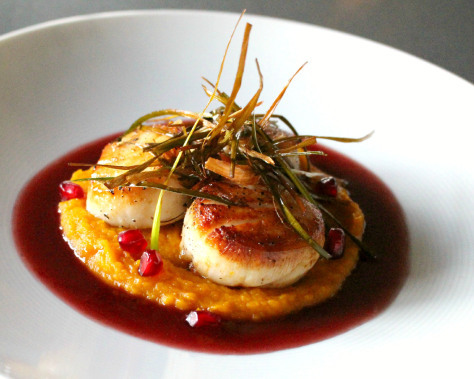 The scallops are seared to caramelly perfection then perched atop a velvety orange, brown butter spiked squash puree. 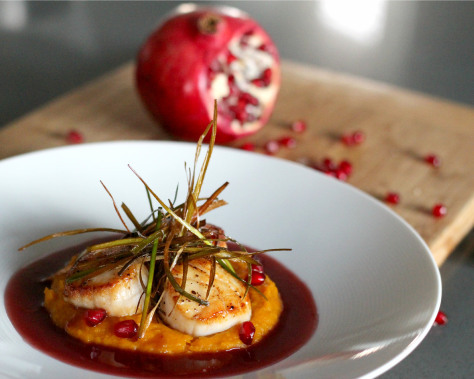 A crimson moat of pomegranate beurre blanc surrounds the plate to provide a sharp, zingy foil to the sweet, rich scallops. On top, a frilly nest of crispy fried leeks to guild the lily and add a little texture and crunch. 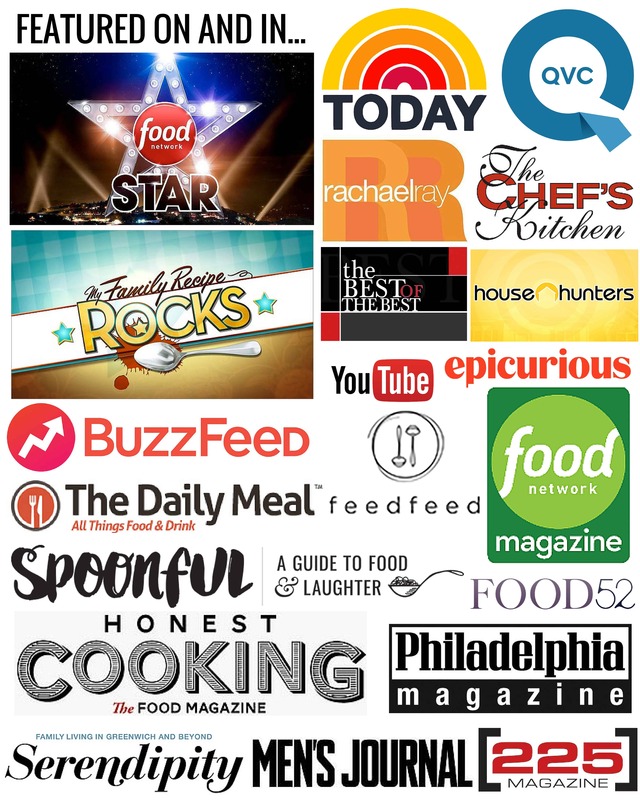 It’s a feast for all the senses. So merry and bright! If you’re struggling to get into the Christmas Spirit, this dish is sure to get you there. Here’s to hoping we all get through the next few days unscathed. Now I’ve got to get back to cleaning (ugh). Rich, elegant and stunning on the plate, this recipe is perfect for holiday entertaining. Add olive oil to a saucepan over medium heat and saute the shallots and salt until translucent. Add in the white wine and simmer over medium high heat until almost no liquid remains, about 5 minutes. Add in the pomegranate juice and continue to reduce until there is only about 1/3 cup liquid - about 15 minutes. Once the sauce is reduced, strain out the shallots if desired (this will give you a nice smooth sauce). This step can be done up to 3 days in advance - store covered in the refrigerator. While the sauce is reducing, prepare the scallops by removing the tough side muscle on each and patting them very dry. It's very important that the scallops are as dry as possible before cooking in order to achieve a nice sear. Season them with salt and pepper to taste. 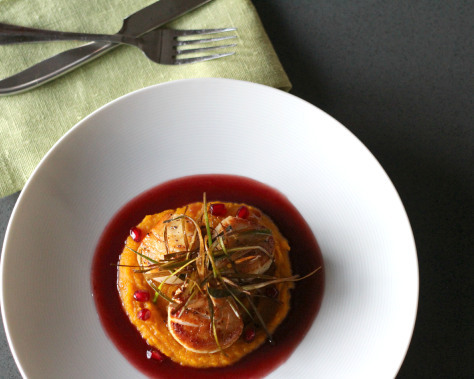 When ready to serve, bring the pomegranate reduction back up to temperature in a medium sauce pan and set aside. Preheat the remaining 2 tablespoons olive oil a large non stick pan over medium high heat. When the oil starts to shimmer and almost smoke, carefully place the scallops in the pan, being very careful not to overcrowd (you may have to do them in batches). Let them sear for about two minutes without touching them, then gently lift one up to see the color. It should be golden and caramelized. If it's not, put it back and crank up the heat. When the scallops are nicely seared, turn them over to the other side and cook for another minute and no more. You want them to be slightly underdone in the center, as they become tough when cooked too much. Remove the scallops to drain on a paper towel. 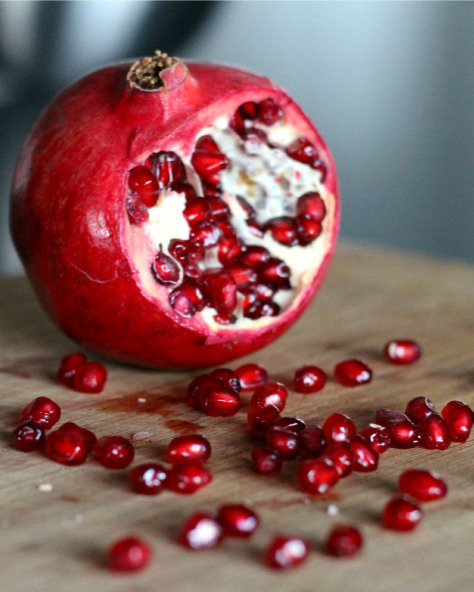 Remove the pomegranate reduction from the heat. While whisking vigorously, slowly add the butter a few pieces at a time until its all incorporated. Taste for seasoning and adjust as needed. To serve, place the scallops over a dollop of squash puree then drizzle the beurre blanc around. Garnish with fried leeks and pomegranate seeds if desired. Serve immediately. Place the squash in a large put and cover with cold water. Bring up to a boil and simmer for about 20 minutes or until the squash is fork tender. Drain and set aside. Melt the butter in a medium saucepan and keep a close eye on it as it sizzles, foams, and eventually turns brown and smells nutty. Pour the browned butter, salt and pepper into the squash and use an immersion blender to puree until very smooth. Taste and adjust seasoning as needed. Cut the leek into 2-inch long sections. Slice down the center lengthwise, and then cut into a julienne. Make sure the leeks are very dry. Heat oil in a deep heavy pot to 350 degrees. Flash fry the leeks until crisp and golden. Drain on paper towels and sprinkle with a little bit of salt. Oh, Coley. Aversa’s is going to put out a contract on you! This will be the first time in six years that we don’t buy about a pound of these suckers from that wonderfully overpriced bakery. I’m making my mom’s old fashioned Icebox Cake for the grand kids on Christmas eve – but these will be for the grown ups to share with a rich dark coffee Americano and Anisette. Ciao! Aversa’s will be fine! Their bread is ok, but I’m not a fan of their pastries – I think they cheap out on ingredients. Just my humble opinion! Hope you make these this year, they are too easy! Yep. Picked up the ingredients yesterday at the Ack-a-me. I’ll be making Icebox cake and these babies on the 23rd. Merry Christmas, girl. Rock on. Hi Coley! Thanks for your recipe for these cookies. Can’t wait to try it and maybe even give them to my son-in-law for Christmas. He gets them from Reading Terminal and they are expensive! His favorite…have a Merry Christmas. Tina H.
Hi Tina!! I so hope you make these, they are fool-proof!! And much much less expensive than buying from a bakery! Your son-in-law will love them. Merry Christmas to you and your family! Hope all is well. Just thought of one of my favorite things – pampered chef chopper. I have arthritis in my index finger and sometimes it’s difficult to chop onions, carrots, garlic, etc. works great. I believe you make these cookies and a bunch of other yummy cookies for Christmas one year, I am going to try the recipe! Wish me luck. I hope these are fool proof! How do you have pictures of it if you aren’t making it until tomorrow, night? WHAT’S YOUR GAME?